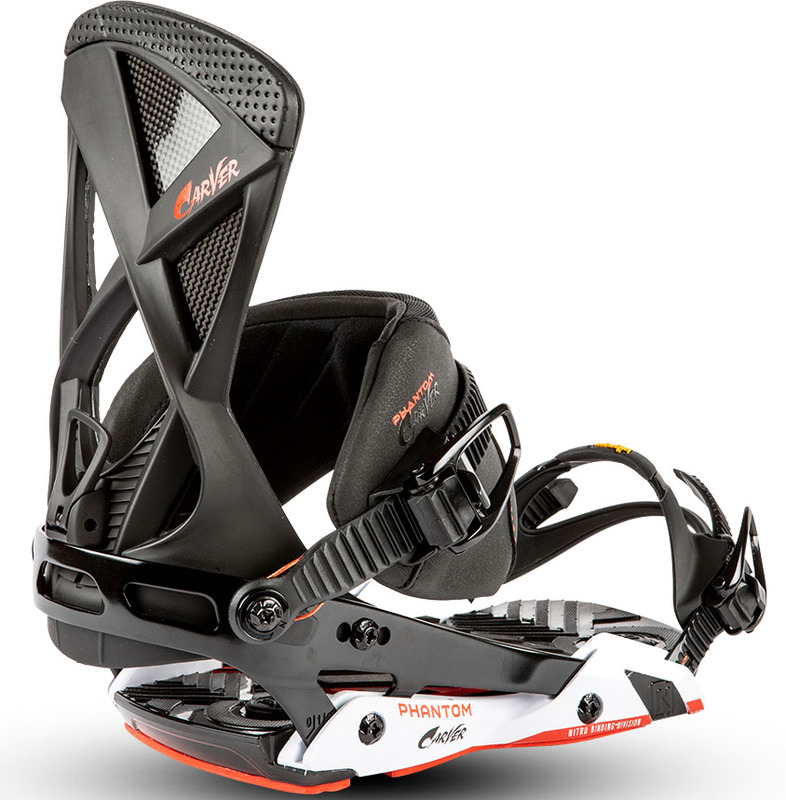 The Nitro Phantom Carver is a binding that just integrated with our boots/board super well. It felt great right into the first turn has good support, good toe straps, good adjustability and a really fun all around ride. We would have loved to do a more extended demo but based on what little time we had at the demo’s we really liked it and unless it just shits the bed on you after you bring it home it seems pretty recommendable. The Nitro Phantom is a pretty responsive well built binding that could work for a wide range of riders. The Phantom has alot of new tech that makes for a good all around binding. The positives are the cant in the binding, the shock absorption, the large asymmetrical ankle strap and a wide high back. There is also a mini disc similar to what Ride has so it reduces the dead spot and increases flex under foot. The only possible down side is the air filled shock pads can break down and pop. We’d rather see some sort of Gell or EVA but it’s still a good binding. We try to get as many images of the Nitro Phantom Carver, but forgive us if they're not all there. Currently running 3 set-ups with burton cartels, union falcor and nitro phantom carvers. Built Donek incline. That’s bindings drive the board very well. The high back is super stiff, so as far as buttering and freestyle, it’s not a good choice. But for carving (as the name suggests), these bindings work beautifully. The straps are super adjustable, however, with size 14 boots, I max the adjustments out and find it a bit difficult to strap in... though this may change after time. The ankle strap is very firm and really comfortable. The “airbag” footbed absorbs chatter nicely. Overall, these bindings donecxacrly what I bought them for; carving hard. They are really comfortable, up there with my cartels easily. I highly recommend these to the guys who are out there to draw lines in the snow and bomb fast.